Born in Cehegín (Spain), 22 years old, and a world championship rider. Not just any rider, mind you – the World Supersport 300 Champion. 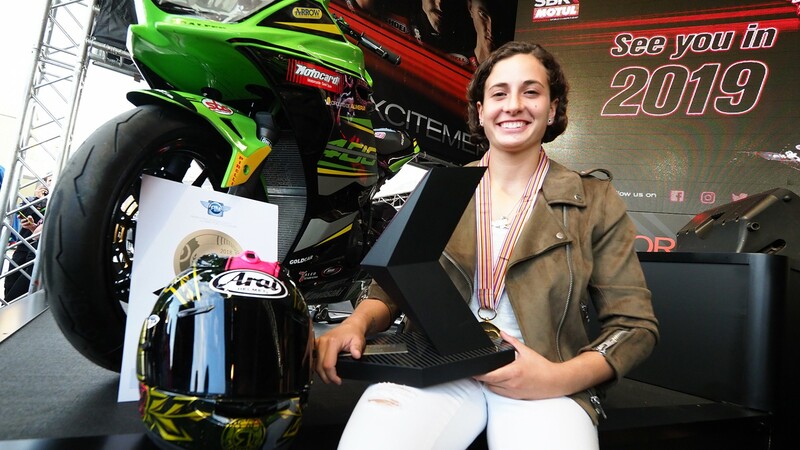 This weekend Ana Carrasco (Kawasaki Provec WorldSSP300) took part in the first stage of her title defence. 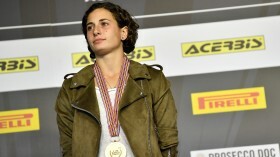 It didn’t go well – she crashed halfway through the race – but the Spaniard is not one to let a small misstep keep her down. Spirited, talented and hard-working, this is the groundbreaker in her own words. A lot of things have changed since I arrived here in 2017. I had been competing in Moto3™ and struggled through several difficult injuries – I had lost everything because of injuries. I came here to start again from nothing. I arrived with the desire to grow and prove to everyone that I could be fast, that I could win. And I think that’s quite clear now. Switching to SBK® was the best decision of my life, I’m really happy to be here and wouldn’t change it for anything. Kawasaki is where I want to be, the team I want to be with. Provec give me everything I need. I think that on a sporting level this is the best of my career. I started all this as a hobby, when I was three years old. My dad was a mechanic, I went to the races with him and we won. Until I was 14, I just did it because I liked riding bikes, it was fun. When I reached the national championship, things turned serious. That’s when I considered turning professional. I haven’t had an easy career. I’ve been through situations which nearly forced me to quit, several times. Not just injuries – I’ve had problems with sponsors, teams… I’ve had to overcome so many things to win. But we managed to turn it all around and become world champions. That’s where my ‘Pink Warrior’ moniker comes from, that philosophy of a warrior who fights right to the end. What has shaped my career has been never losing that belief that I could succeed. I never felt like I had to break down any barriers or reach any milestones just because I was a female rider. My goal has always been to be the best, to win championships. Breaking down barriers has never been the goal, but the result of my good performances. I think that we have to work a lot in terms of gender equality and I try to do that with my job, but I don’t consider myself to be a feminist idol or anything like that. I think that you need to work to get results, and with the results comes change. It’s what I’ve been doing my whole life and I’m thrilled that my accomplishments can help. Inside the circuit I’m a rider, outside the circuit I’m a woman. That’s what I always say. When I cross through those gates, my job is the same as for anyone else and my goals are the same as well. I’ve never seen myself as different from the rest. To “Ride like a girl” is to ride well and win world championships. We took advantage of that moment to show the entire world that riding well or poorly is not about your gender but about how much work you put into it. I don’t think much in the moments before a race. The strategy has already been discussed, although having a strategy in itself is tough in this category. I try to let my mind go blank when I’m racing, it’s a championship where you mostly improvise. If you’ve got a well-thought-out plan and it doesn’t work out, you can easily be left out of place. So, I just go with the flow. No, I don’t pray to anyone at the end of a straight, not even Saint Brembo! [laughs] We’re used to the speed and everything seems slow on track, even if you reach the end of that start-finish straight at 200km/h. It’s a different situation when there are seven of us riding abreast, then you do commend yourself to someone – anyone, whatever guiding saint that’s available at that moment is the right one! Winning is what keeps my engine running. Honestly, I enjoy this when I win. I mean, of course I enjoy riding, but riding and taking part in a race are two very different things. A weekend in a world championship is stressful, there are a lot of nerves, a lot of work, and you always need to put in 100%, whatever the conditions. That all adds up and you don’t enjoy riding so much, so my only goal is to win: if I win on Sunday, I enjoy the entire weekend. It’s my reward for so many days of hard work. I was lucky that Jonny [Rea] began helping me last year, he gave me some pointers and now we’re practically teammates. To be so close to the best rider in WorldSBK history is a huge plus. I couldn’t have a better mentor! 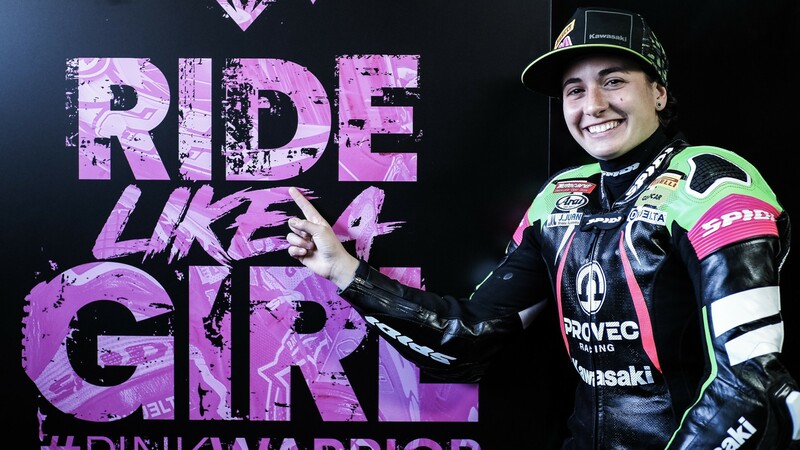 No woman has ever competed in WorldSBK? Well, no woman had ever won a world championship! The only limits are the ones you set yourself. I realise that getting into WorldSBK or MotoGP™ is hard, because that’s where the best in the world ride, but I’m just 22 years old, I’ve got plenty years in front of me and tons of things to learn, it’s a long-term goal. I don’t know if I’ll still be riding in ten years’ time. I’ll be 32… You never know, this sport changes very quickly from one year to the next. It depends on how your career is going, how willing you are to push on. But I would like to stay in this environment, to work inside a team or manage a team of my own. Relive Carrasco’s best moments in the WorldSSP300 championship and follow the 2019 season thanks to WorldSBK VideoPass.